The ‘one size fits all’ mobility scooter canopy from Scooterpac has been cleverly created to offer you protection whatever the weather. Come rain or shine this revolutionary scooter canopy can be easily folded out or put away in seconds! Unlike conventional canopy systems that must be fitted each time you leave your home, the Scooterpac canopy conveniently remains on your scooter in the pack attached behind the seat. This makes it really convenient if you’re in a rush to get somewhere but the weather isn’t forgiving. Being compatible with almost any mobility scooter from a small transportable to a large 8mph scooter the Scooterpac canopy has the capability to fit the scooter you already have. Fitting the canopy for the very first time is simple and only takes around 10-20 minutes by following instructional video included to help you do so. Of course if you have any concerns or problems fitting the canopy we are here at Easy Mobility Services to help. Once the canopy has been fitted it can be easily opened and closed in seconds with colour coded Velcro aids to help you. The frame is made from a super lightweight aluminium meaning it won’t alter the smoothness of your drive and takes the worry of rusting of your mind. You don’t need to worry about ever-changing your mobility scooter in the future because just as quick and easy the Scooterpac canopy was to install it is to remove. Access to your scooter is easy through the opening zip sides and visibility is clear through the front Perspex windscreen. 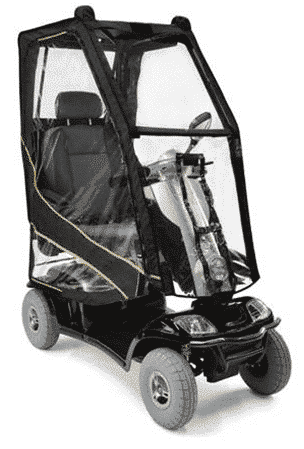 The high quality canopy material over the sturdy aluminium frame means reliability from this mobility scooter canopy for many years to come. The best thing about the simplicity of the folding mechanism is that if you’re out driving and it does start to rain, you can easily fold out the canopy in seconds stress free. This can give you the peace of mind knowing that whatever the weather is looking like you will be prepared for it either way. The canopy is not just useful as a rain cover, it’s also extremely efficient at shielding those sharp winds. If a gust picks up and you’re worried about your possessions falling out of your scooter or your hair blowing in your face, then by quickly putting the canopy up can keep you safe and protected from the wind. The adjustable arms of this mobility scooter canopy are what makes it so versatile, being able to fit to almost any shape or sized mobility scooter means you never have to worry about what make or model mobility scooter you have and if the Scooterpac canopy will fit. Arguably the best feature of the Scooterpac canopy is it giving you the peace of mind to easily go outside on your scooter whatever the weather. 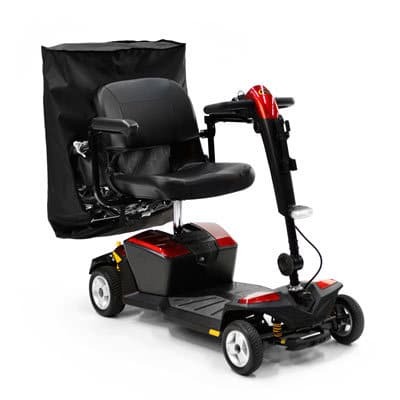 If you would like to know more about the Scooterpac mobility scooter canopy please contact us or call into one of our showrooms for friendly expert advice for your mobility products.